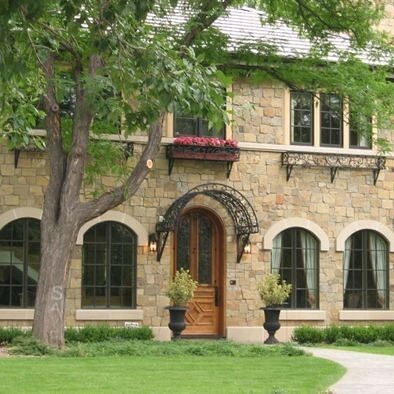 In 2009, I wrote a blog post on this beautiful house, which was on the market at the time. The architect of the house is Keith Summerour. I had long admired the design of the house, and particularly liked the awning over the front door. 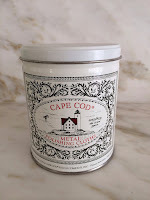 The color of the metal (zinc perhaps? 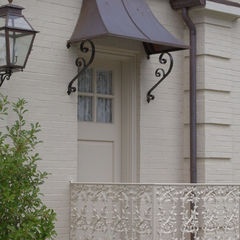 ), the curve of the design, the ornamental metal brackets that hold up the awning are beautiful details on this house. I didn’t know the name of this structure at the time I wrote the post, but several readers informed me that the proper term in ‘awning’. 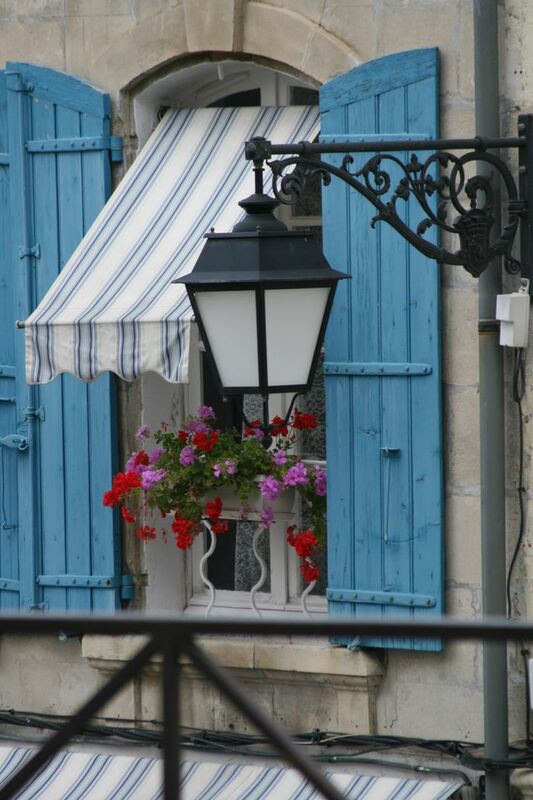 According to the Wikipedia page on awnings, they are most commonly made of canvas. One of the most familiar uses of awnings are for store fronts, with the name of the shop written across the front. 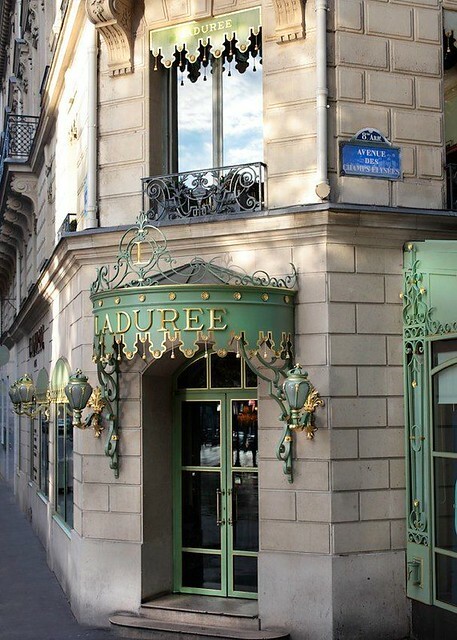 What better example of this than the famous Ladurée of Paris? When I was in Paris this June, it was quite rainy and we took shelter many times under awnings such as this, which are all over Paris. Note the wheel on the upper right – this awning is almost certainly retractable. 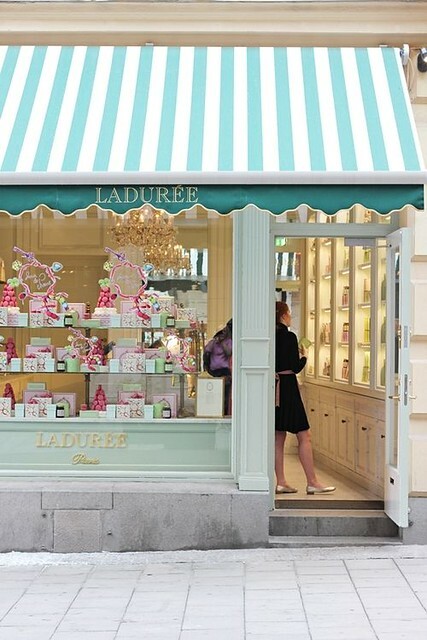 Another picture of a different Ladurée shop that I found on Pinterest shows an elaborate metal awning. 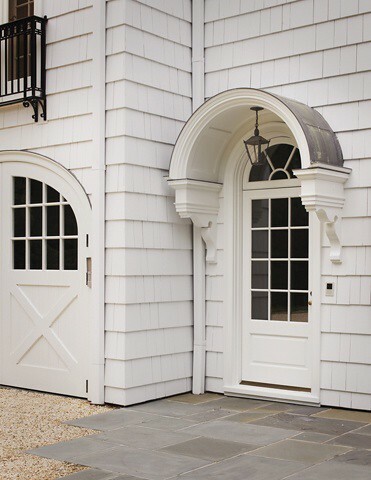 I love this design for the arched door of the entrance. Miles Redd’s NYC home. Although the door and the color scheme are often the focus of people’s admiration for this house, I think the awnings definitely add to the beauty and charm, don’t you? 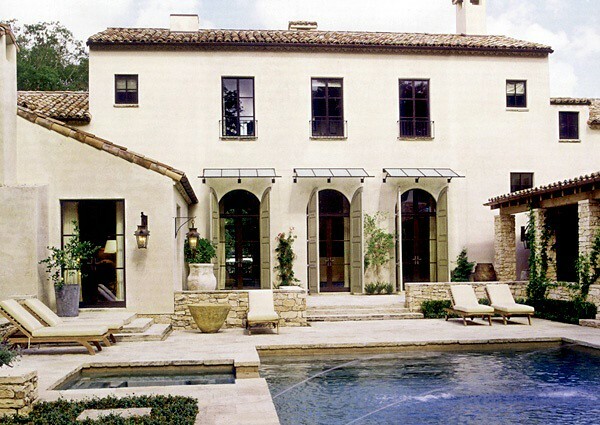 Canvas awnings are commonly used as both a design element and a way to protect doors and windows from the elements. This example is particularly striking, found on the blog Beaux Monde. He completely transformed the look of his back yard with her outdoor set from World Market and those striking awnings made of striped Sunbrella fabric. I imagine that fabric awnings are best suited for places that don’t get snow (these are in California), as the weight of the snow would certainly damage the awnings – or, the awnings would definitely need to be retractable so they could be pulled back in the winter. 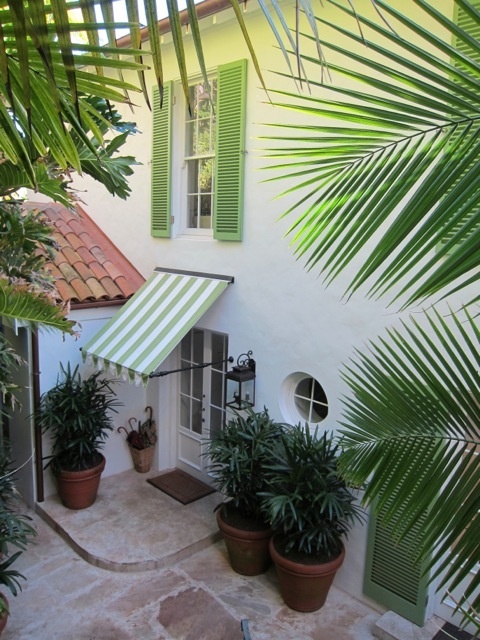 A lovely green striped awning covers a side door. Given the umbrellas by the door, this location probably gets its fair share of rain – and what better way to shelter from the rain when opening the door. Via Pinterest, attributed to Serena Crawford. I thought this awning was interesting – the window is arched, but the awning is straight. These are almost certainly inswing casement windows, which would allow the awning to stay in place even if the windows are opened. I found a few dome shaped awnings that provide an alternative to the more straight line style. 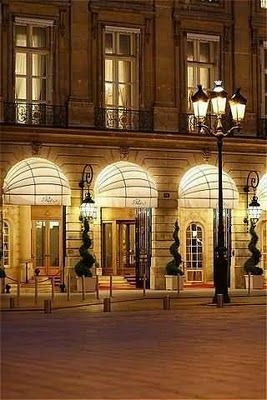 Here is an extravagant example from the Ritz Hotel in Paris. 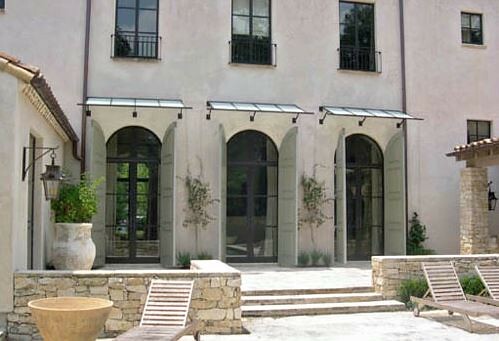 Dome awnings over three arched doors work well given the limitations in space due to the door design and roof height. I wonder how much these block the view from the inside? Perhaps they are needed for light control. I see more metal awnings in Atlanta than canvas. Although this house is not in Atlanta (I believe it was featured in an old Southern Accents), the design of the awning with its pretty metal brackets caught my eye. I wish I knew which Southern Accents this is in – I have most of the issues from last 10 years of the magazine. I would love to see the inside of this house. A small metal awning that fits perfectly into the cased door opening. Another curved awning that complements the color of the lanterns. 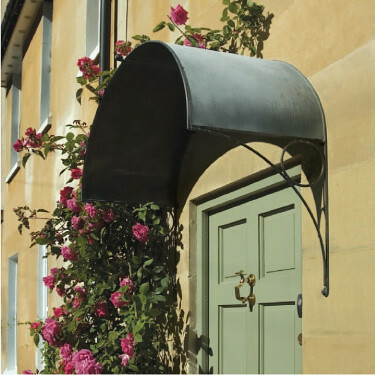 This was one of the first awning pictures I found on Pinterest – simple but beautiful. The angle of the photograph prevents a view of the top design of the awning, but the iron bracket design can clearly be seen from eye level. A semi-circle design makes an interesting metal awning on this house. 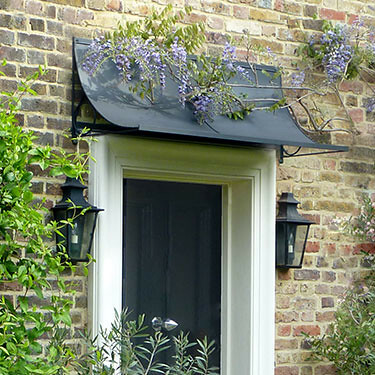 This is a beautiful metal awning, with its delicate lacy pattern that is also reflected in the window boxes above. Via Pinterest. This ventures more into eave or overhang category, but perhaps inspired by awnings. 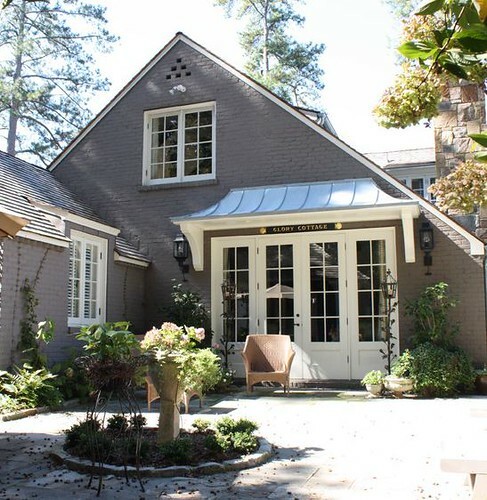 Guest cottage designed by Bradley E. Heppner. 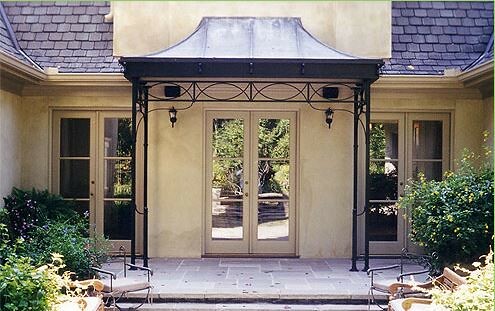 An awning that has supports is called a canopy – and this is a beautiful example. By Calhoun Design and Metalworks. Via the Scout Guide, by Calhoun Design and Metalworks. 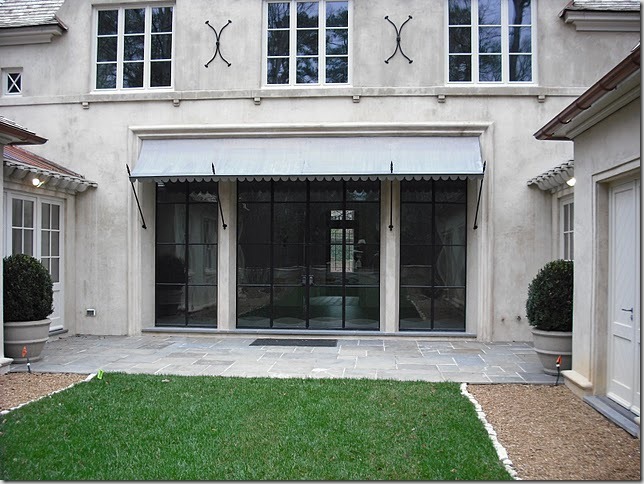 Gorgeous metal awning custom designed for this steel window. Note the scalloped edges of the awning. I believe this is made of zinc. Architecture by Stan Dixon (he designed the awning too). I love the design of this awning - the metal goes right up to the bottom of the window on the second floor. Via Pinterest. I have studied this picture many times. The house has exterior shutters, which are clearly operable. But, the three arched doors also have what appears to be an awning of sorts, or maybe they are solar panels? Here is a close up from the architect’s website. What do you think? Contemporary awnings or solar panels? I like that they are out of the way and protect the view from the inside. Architecture by Murphy Mears. 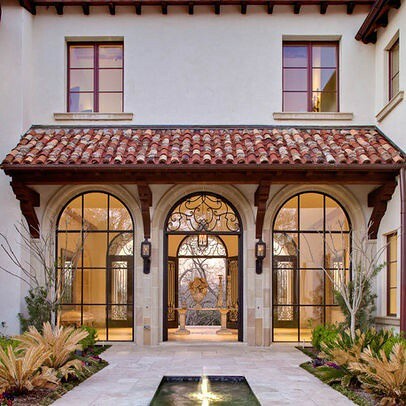 Here is another house from the impressive portfolio of Houston based architects Murphy Mears – and a similar design can be seen on the awning over the arched front door. Finally, to round out the post, a few more awnings that are neither metal or canvas, and may not even technically be awnings but more eaves or overhangs. Via Pinterest. I love this picture that I found on Pinterest. The structure is covered with the same material as the roof, and is tucked into the sides of the house and located between the upper and lower floors. The light and view from the windows is not obstructed, and the eave is a beautiful architectural element on the back elevation. 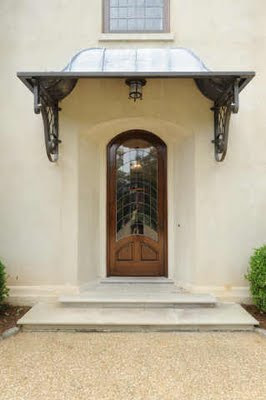 Beautiful arched overhang that reflects the shape of the door and is clad with what appears to be copper. Architecture by Bradley E. Heppner. 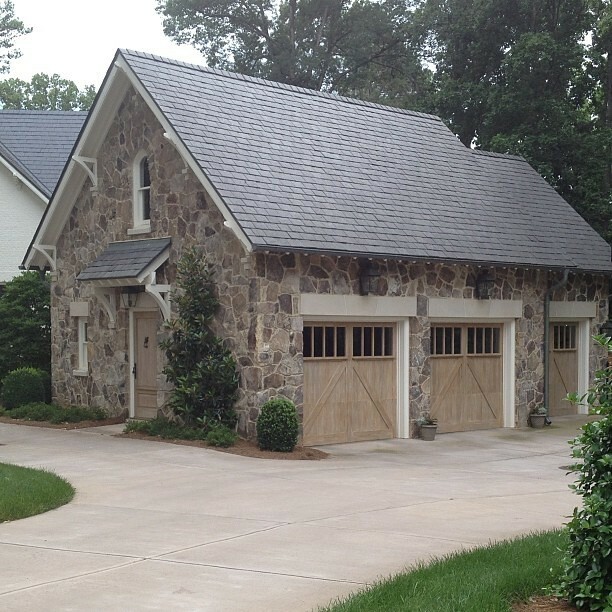 This door to the garage is elevated in importance because of the overhang overhead. The roof is clad with the same slate as the rest of the house. 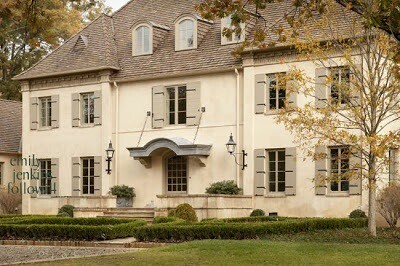 Architecture by Frank Neely, image by Limestone and Boxwoods. A show stopper of an overhang (would you call this an awning?) 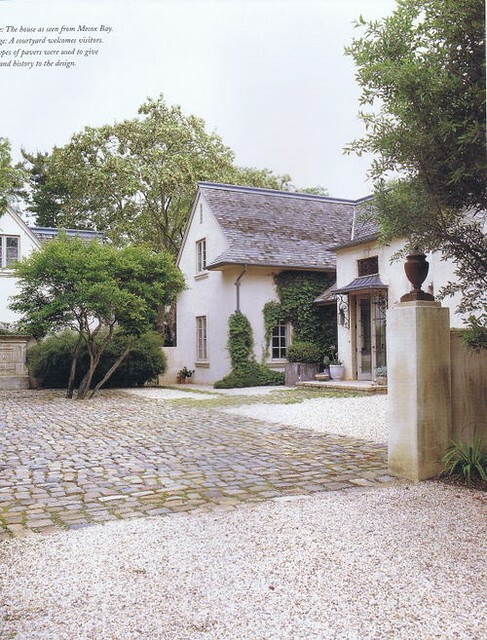 at a renovation by Stan Dixon; it transformed the whole look and feel of the house. I love how it is anchored into the side of the house. Architecture by Stan Dixon. Photo by Emily Followill. 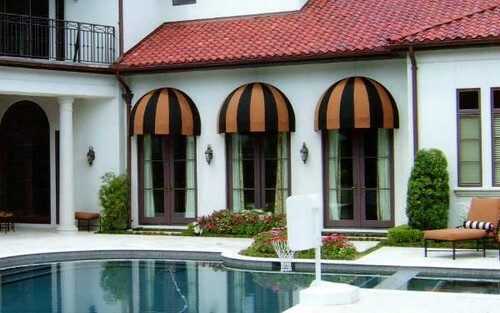 What do you think of awnings? Do you have a favorite picture, or a favorite material (canvas, metal, or other)? Of course, it all depends on the style of window or door, and the reason for the awning – light control, weather protection, or looks. 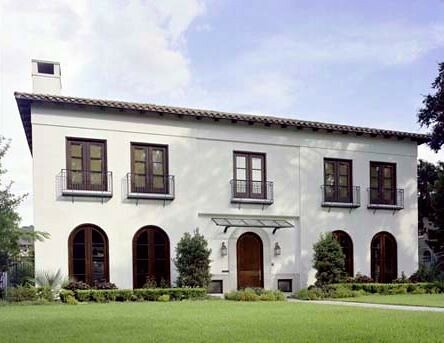 Overall, I think I prefer metal awnings for the beauty of the material and their permanence, but I also really like the clean lined and simple contemporary awnings used on the Murphy Mears projects too; they provide protection without blocking the view or the light. A big thank you to this pinner’s and her awnings board – she clearly has a love for awnings and is constantly updating her board with new pins. Because so many of these images come from Pinterest, please let me know if you can identify a source. Fun awning tour Holly! I think of the architectural variety such as the wonderful detail at the back entrance at the Heppner house as more of an eave or overhang. I am partial to canvas awnings. My inlaws had a marvelous one I loved on their back terrace that was a permanent summer structure (poles stayed up all year but canvas came down). Yes, I agree - some of these are definitely more eaves or overhangs. This was an architectural concept I was grappling with and clearly ventured into non-awning territory! 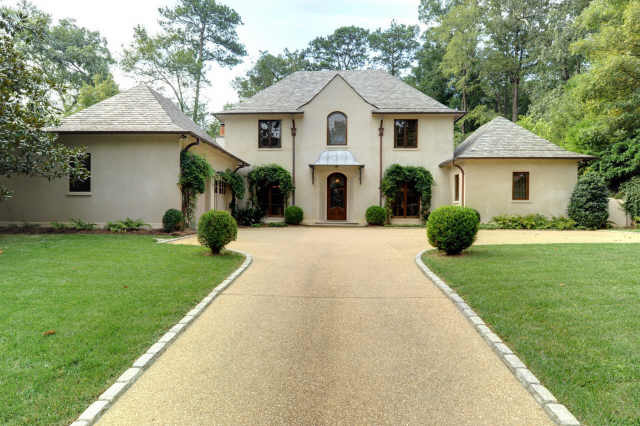 I am convinced that Atlanta has the most beautiful houses in the country! Lots of photos, indeed! Gorgeous post, Holly! 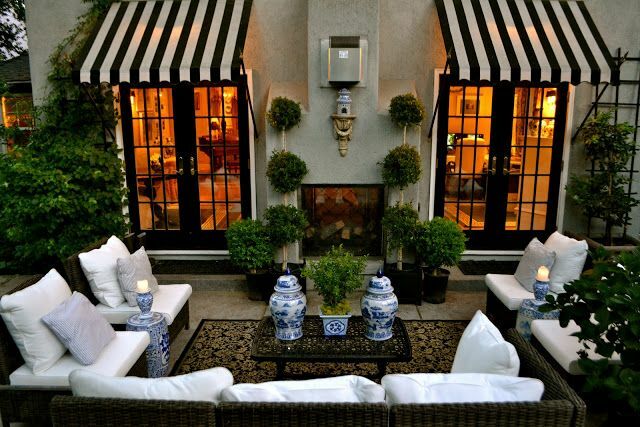 Awnings and canopies are so charming and gracious. I especially love the copper and zinc ones. I see them more frequently in Europe. 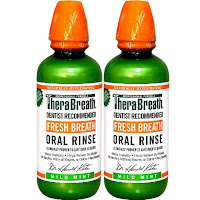 Speaking of which, do you know this company? The next time you are in England, check them out. Another winner of a post. Such a great round-up of ideas. It's got us thinking of what we could do around our house. Thanks! Oh how I love a good awning. And isn't pinterest an amazing source of inspiration. The home with the metal awning that goes right up to the bottom of the window on the second floor is the home of none other than Jan Showers!! I like the metal awnings -- the simpler the better. I think the Heppner arched overhang is my fave. 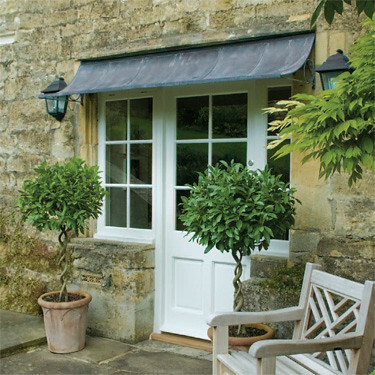 I've always loved canvas awnings -so charming and old fashioned. My Coop building allows them (solid orange) and before the days of AC each apartment had them (I still have the hooks!) but sadly -only one apartment still retains these in the summer. I hate to loose the sunlight so wouldn't consider them myself. Classic Things That Inspire. Love it. I like the contemporary ones at the house by Murphy Mears. I think that house was in Veranda a few years ago. I always wondered why they did not show the front. 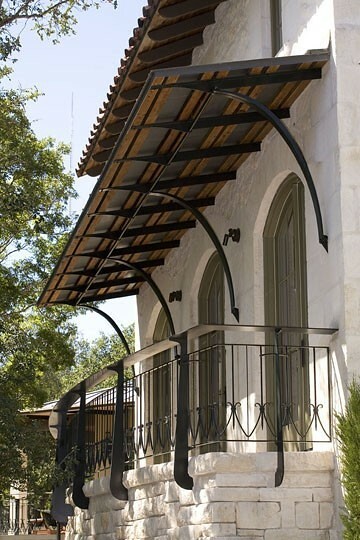 I am the biggest fan of awnings and the metal ones are especially beautiful. 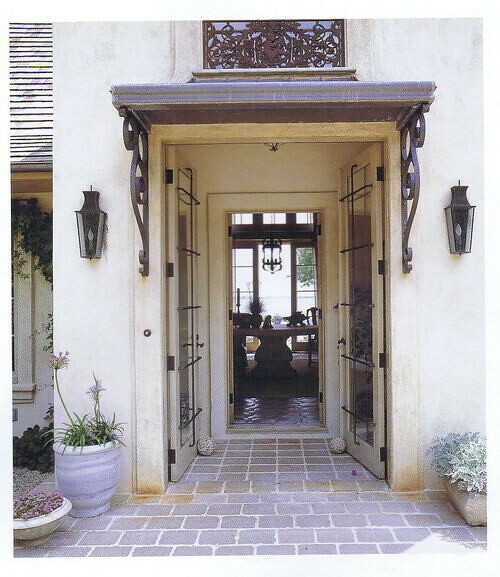 Include me in those smitten by the arched awning from Bradley Heppner...stunning! Wonderful post! As a long-time fan of awnings, you've given me a lot to look at and be inspired by. 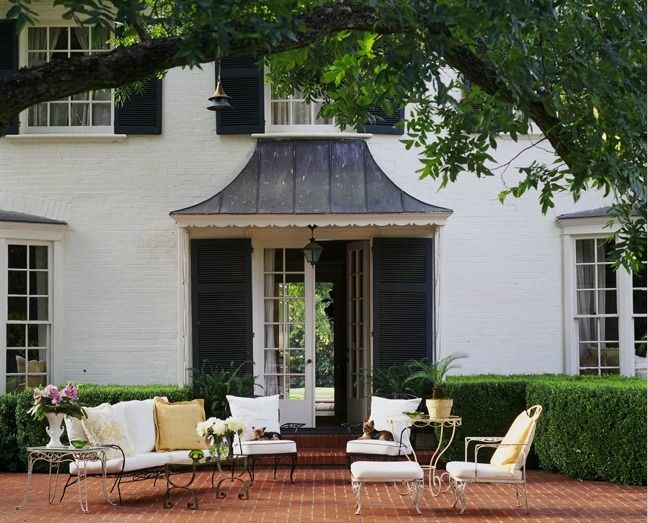 I also love the look of wooden trellis-type awnings, e.g. Walpole Woodworkers. Lovely for climbing roses, etc. Dear Holly, what a great selection you have found. 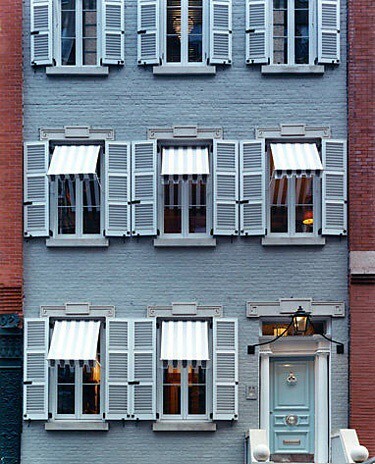 It always bothers me when a home does not have beautiful shutters. Now I am starting to feel the same way about awnings! I think that awning add so much to a home, and you have showcased some beauties here, Holly. I think the "solar awnings" in question look like frosted glass to me. Beaux Monde is a he not she:) Beautiful post. beautiful pics! I love the metal awnings... such a great updated look. Thanks for sharing. Hope your fall is off to a wonderful start! Wow! So many gorgeous awnings, Holly! Love posts like yours that always let us know you put a lot of thought and time into it! My mother in law has one of the most wonderful awnings I've ever seen! Maybe I should photograph it! 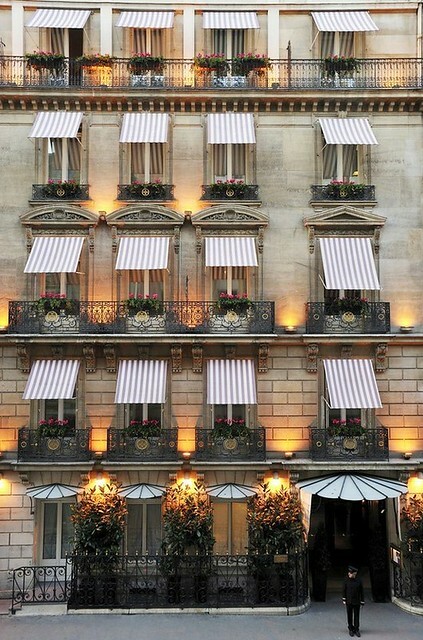 And….the awnings on the Lancaster….wow…that is my favorite hotel ever that we have stayed in! Makes me really want to go back to Paris! Thanks for sharing all of this with us! Very unique awning photography. Awnings reduce your consumption of energy by keeping your home cooler during the summer months and increase the value of your home by adding beautiful accents. So wish we would see more of this in the Northeast.